Permitting shipping container buildings is about get much easier for our customers. After hundreds of hours of research, meetings, and evaluations of our manufacturing process, we received Evaluation Service Report (ESR) 4163 certifying that Falcon Structures can supply shipping containers fit for use as building materials as outlined in AC462. ESR 4163 also makes Falcon Structures the first in-house modified shipping container manufacturer using code compliant containers. Using AC462 compliant containers saves customers and coding officials an enormous amount of anxiety and accelerates the permitting process. Until as recently as 2016 developers and other builders hesitated to use shipping containers as building materials because there was a risk the local authority having jurisdiction, aka the code official, would not approve a container structure. Permitting shipping container buildings was often a slow process because code officials found themselves in the uncomfortable position of signing off on an unfamiliar building material. If the code official was willing to give container buildings a chance, they would have to spend a significant amount of time and resources researching the structure’s safety based on the provisions outlined in ICC’s Alternative Means and Methods Section. Now, code officials can use the guidelines in AC462 as a road map for safe container use. ESR 4163 confirms that we can supply high-quality, AC462-compliant containers. Receiving an ESR also means we can provide exact container specs to engineers validating the structural integrity of the overall building. Builders can be confident their projects will be approved, and code officials can now more quickly than ever ascertain the container buildings they sign off on are safe. Initially, the industry was confused by AC462. We weren’t sure if it was possible for any company to meet the outlined standards and receive an ESR. So, we made our own company a test case. If we could reach AC462 compliance, it would signal to the rest of the industry that yes, AC462 was a reasonable piece of code. Once, we parsed through the jargon, we formulated a plan to expand our existing quality control management system. The framework was in place — we had in house procedures to ensure our containers were high quality. Creating thorough documentation and precise standards was the next step. While all the documentation seemed inconvenient at first, reaching for code compliance spurred important conversations. Standardizing our manufacturing process pushed us to put our practices under a microscope. As we evaluated and improved our process for the ICC-ES’ inspection, we became a more efficient company. The conclusion of the Falcon Structures test case: AC462 is absolutely within reach and enforces a standard for safe, quality containers that we want to see proliferate throughout the industry. Our advice to other companies sizing up AC462 would be to not look at reaching code compliance as a hassle, but as an opportunity for growth. We anticipate confidence in coding container structures will grow as more companies achieve AC462 compliance, and customers see the coding process expedited. With rigorous quality control in place and ESR in hand, we’re ready to lead an expansion in shipping container-building and modular construction. Update: New routes for permitting shipping containers are coming! Learn about how containers are being formally incorporated into the 2021 IBC. 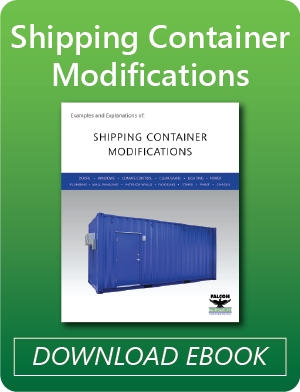 Have more questions about shipping containers and building code? Contact us at 877-704-0177 or email sales@falconstructures.com.